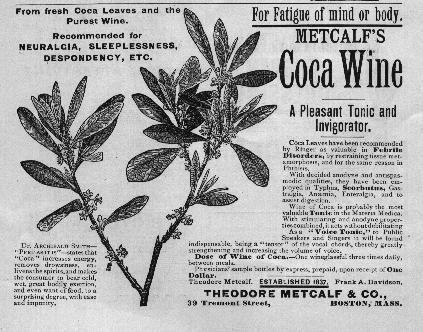 "For fatigue of mind or body"
"A pleasant tonic and invigorator"
"To some persons nothing is more fascinating than indulgence in cocaine. It relieves the sense of exhaustion, dispels mental depression and produces a delicious sense of exhilaration and well-being. The after effects are, at first, slight, almost imperceptible, but continual indulgence finally creates a craving which must be satisfied; the individual then becomes nervous, tremulous, sleepless, without appetite, and is at least reduced to a condition of pitiable neurasthenia."